BB Govinda Swami: One should feel oneself meek and humble and also has to tolerate. Tolerance without any limits. Krishna will do this to us because that’s the standard. He’ll do it to us. It’s not that He dislikes us for a moment. But He will test our tolerance until the end of our ability to tolerate anything. We think: “After this point I’m gonna go crazy”. And Krishna says “Ok” and will push us a few kilometres beyond that point, to make us see that we have to tolerate everything without limit. Has anyone ever felt that that’s the end? Has anyone ever felt that way? At the very end. I’ve described this situation before: like being at the bottom of the Ganga, with a big stone on top of you, no place to go, no air to breath. Or being just backed up against the wall, no place to turn, no place to to run to, no place to hide. You are just like against the wall and you don’t know what to do and there’s only thing you can do is to call upon the Krishna’s Name. 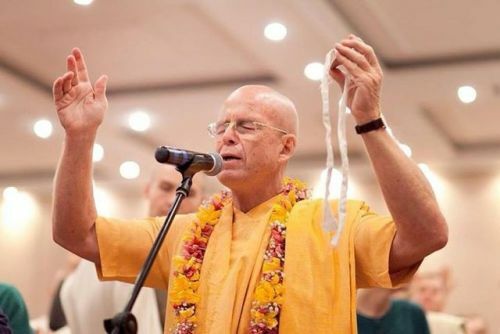 And then when you surrender to Krishna, then Krishna just… phew! Everything will changes in a second. Just in the second everything can change, if you surrender to Krishna. “Oh, that’s because of that damn temple president! Oh it’s because of that temple council! Oh, that’s because of that mean old sanyasi Govinda Maharaja! Oh, it’s because of this or it’s because of that! That is why I am in this horrible situation! Because all these guys are against me! All these guys are making intrigues and making politics against me, because they can’t understand how cool I am! They are just envious me, because I am better than them! This is why it’s all happening: because they can’t see that I’m better than all of them! So they’re just doing this whole politic against me!” We’re thinking like that. And it’s just Krishna. It’s just Krishna. Krishna says “O, you think you’re better than everyone else, right? Oh, you think you’re so clever, because you’re translating book into Kazakh language. Oh you’re so clever, because you can give cool talk on Krishna consciousness all about psychology. Oh you think you’re so cool, because you can lead a kirtan. Oh, you think you’re so cool, because you can cook a good samosa. Oh, you think you’re so cool, because you have enough energy and practically speaking nothing can stop you and you can just walk all over everyone. Ok, what are you going to do? You are flat against the wall. Hey, Mr. Cool, you’re flat against the wall! You can’t do anything and you go crazy! If you’re so cool, why don’t you do something? You’re so clever, so crooked, so intelligent, smarter than everyone else. Ok, come on, do something”. And we can’t even move and we’re just going crazy and insane, it seems like life is coming to an end. And what is required to change? Only our consciousness.